Since everyone's doing it and now that all of you jumped off a cliff and there's a nice pile of bodies to break my fall, banzai! The Rules: Grab the nearest book. Open the book to page 56. Find the fifth sentence. Post the text of the next two to five sentences in your journal/blog along with these instructions. Don’t dig for your favorite book, the cool book, or the intellectual one: pick the CLOSEST. Tag five other people to do the same. "However, it can also offer some performance improvement in cases when you know a SELECT statement will return only a single record (for example, if you include a WHERE clause specifying a value from a unique column). In this case, you can use CommandBehavior.SingleRow to inform the provider." This is from O'Reilly ADO.NET in a Nutshell, a book I haven't looked at in at least 5 years. The thing is, my programming books, haven't really used any of them since I can just "google it", are in the printer stand which is closer to me than my bookshelf. 1. Link to your blogger and list these rules on your blog. I can read a 500 page book in Russian but my brain shuts down when I try read half a page of news. I have several terabytes of anime spread across DVDs, 3 computers and 2 external drives. After we finish watching a series, I can't bring myself to erase it. I almost always have 5 2lb sticks of salami hanging from the ceiling in my kitchen. Even though I liked the subject, due to my bad memory, I managed to fail every Biology test, quiz, midterm, final and regent. I wear a kimono for suedat shlishi and also if I don't go to shul because I'm sick or my wife is sick. I wear it even if guests are coming. I hate gefirte fish. I'll eat it when there's nothing else. My neighbor mixes it with vegies and sauce. I bake A & B salmon gefirte fish in tomato sauce for Yom Tov. Other than those situations, never, no way, no how. I'm not gonna tag anyone because I'm lazy and because everyone's doing this anyway. Tomorrow, in my shul, 1749 Ocean Avenue, between L and M.
Born December 23rd at 3:59PM. Weight, 7lb 15oz. Ironically, Shlomik was also 5 days late and was 6lb 15oz. Also need Enfamil Gentlease and regular. Hanukkah is the festival of clementines. For eight days we celebrate these wonderful fruits. Stores and homes are filled with boxes and bags of clementines. People are eating them for breakfest, lunch, dinner and as a snack. Shuls are serving them for suedat shlishi, Chanuka parties and any other functions. Garbage bins are overflowing with orange peels. Due to inability to say mezonos on clementines, we eat doughnuts which are similar in shape and whose sweet taste compliments the tangy taste of clementines. Though saying chamotzi on challah rolls would be an even greater elevation of this great fruit, it was decided that people would be too lazy to say the very long benching. We also light eight candles which is the minimum number of segments that a clementine has. It's believed that this holiday was started because rabbis saw people getting sick due to the onset of cold and lack of enough vitamin C. While both the orange and the tangerine were considered, both of those were much harder to peel and more prone to contain seeds. 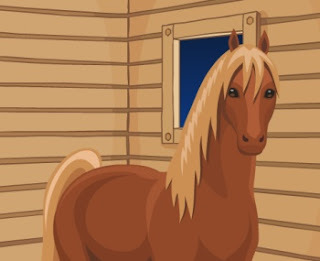 Do you like horsies, unicorns and point and click room escape games? Well, even if you don't like horsies and unicorns, this game is very well done and is even logical. This week there was something very interesting at Daf Yomi. Too bad all those rabbis who are telling their students that all of them must go to kollel and working is evil never learned this. This is from Kiddushin, page lamed (30) side beis (2). The father is obligated to teach his son a craft. From where do we know this? Chizkiya said: "For the verse states: See life with the woman whom you love." Life connotes craft (for a livelihood) and is here next to woman. If "woman" is to be understood literally, then just as the father is obligated to find his son a wife, he is obligated to teach him a craft. If, on the other hand, "woman" is to be understood allegorically to mean Torah, then just as the father is obligated to teach his son Torah, he's obligated to teach him a craft. Rabbi Yehuda says that anyone who does not teach his son a craft, teaches him banditry. Gemara asks if this is what he really meant and answers that what he meant was that it's as if he teaches him banditry. Since his son doesn't know how to do anything, his only means for supporting himself is by stealing. Gemara places Torah, wife and a job on the same level and obligates the father in all three equally. No one comes to defend the father and say that he should get his son a rich father in law or that the son should steal money from the government or go collecting charity or sitting and praying onto G-d to fedex him money every month. Just as you're supposed to teach your son Torah and to get him a wife, you're supposed to teach how to go out and earn an honest living. The response of today's yeshiva rabbis is a two prong attack on this "fallacy". One, condemn secular education, the one needed for getting a job, as evil and not part of Torah leaving. Two, condemn working people as criminals who are wasting their time working instead of learning Torah. My cousin works as prison guard in Colorado. I was talking to him on the phone and he asked me "Did you know how many Jew are in prison?! ", "Yeah, wanna know why?" Here's the proof of the existence of the horror mentioned in my previous post. I only scanned in three pages because of the fear that my scanner would commit suicide. Jacob Da Jew posted our kids' Parshat Quiz a week ago. I found something even better. A couple weeks ago, Mike In Midwood, was by my house for shabbat. One of the things we talked about was yeshivas, as in where should I send my son. I mentioned that I went to Chaim Berlin and that it had pretty good education. All of our teachers, except for dee dee dee computer teacher who was probably someone's relative and knew as much about computers as the secretary, were public school teachers and knew their material. Granted, it was 15 years ago and I was in grades 9-12, but I just couldn't believe Mike's claim that now it's much, much worse. Until, that is, I found this gem in my shul. The "rabbi" is rebbe M.J. 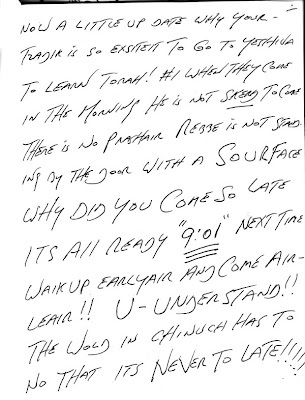 The whole thing is handwritten, apparently he doesn't know how to use a computer either. 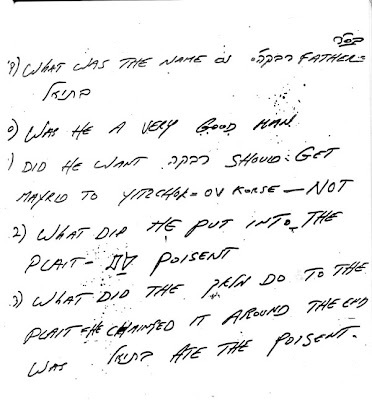 I think his Ds look like Gs, or he's even worse than he appears...Also, it took wife and me a lot of rereading to decypher the horrible "penmanship". BTW, those are not paragraphs, they're pages. Dear Very Very special [choshev] parents [?]. Boroch Hashem An outher Wonderfull Happy SuGsesfull Week went true Every Tzadik is so Happy a Hall day in class in yeshiva What That is the Most inportent They Should Be Happy and The Happyness Will Bring [?] Good Rezults. Now a little up date why your Tzadik is so exsiteit To Go To yeshiva To learn Torah! #1 When They Come in The Morning He is not skerd To Come There is no Prashair Rebbe is not Standing By the door with a SourFace Why DiD you Come So Late ITS All Ready "9:01" Next Time Waik up earlyair and Come Airleair!! U - Understand!! The Wold in chinuch Has To No That its Never To Late!!!!! We Even Have Time To Give Them To eat BeFor Davining And Learning Brakfast is Being Served Every Morning Bread Juice milk Hot CoCo Some Times WHen THere is "PainCakes" THe Last Few Days I Addit SomeTHink New its Corn Flakes - Y NoT! THen WE STart Learning THe HayLiGe ToraH THe HayKiGe Alef Bais LeTTers THe FounDayTion OF THere LIFE!!! WE Do IT Many Ways ON THe Big [next page] ALEF BAis CHart ON THe Bord - We Do it in THe Alef Bais SayFers THe MAin THink is ITs Don WiTH Lov, MAke THeM LoV THe ToraH THaTs OUR JoB!!!! LETs Be THem [mekarev] Kiruv Now!!! ITs [some hebrew capital letters] Talking ABout [same hebrew script letters] I Can Right A Couple of SForim!! 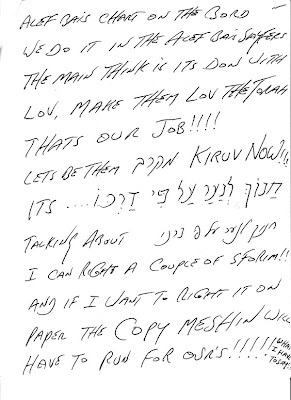 And IF I Want To RiGHT IT ON PAper THe Copy MeSHin WiLL Have To Run FoR ourS!!!!! WHat I Have To Say!! We Do IT BoTH Ways THe puzzel Way And THe TaTe Way [my fingers hurt capitalizing the letters he capitalized so from here on all letters will be small] witch ever ever way he does it now is fine just watch him and lisin good how he pernonce's everything. But I have great "Miricle" news to tell you l'kovod shabbos mvorchim chodesh kislev that a lot of tzadikim from the class are reading all ready like a tate b.h.!!! I am not rushing at this time qw just have to cuntinyou practeasing and practeasing and practeasing like my Rebbe used to say practice makes perfect!!!!!! yes there isint a day rebbe shouldint skrim say where is the yiras shumayim? And all [choshuv] parents should tell their that at home and all over where we go we most have yiras shumayim and no that hashem is all over in the winter in the summer ALL OVER!! 8. what happend when [sara] closed her eys = the clouds when away, the candels burned out, the. And now my fingers hurt and I have a headache. Barf.